This chowder epitomizes the concept of “savory.” It is well seasoned and flavorful, and a longtime favorite at our house. Spicy, garlicky chorizo sausage counterbalances the inherent sweetness of the white fish, and the grassy green pepper and cilantro leaves and stems complement the neutral base of onions and potatoes. A pinch of allspice subtly transforms the tomatoes. But underlying all of this is homemade fish stock that adds body and a certain depth of flavor. The recipes for both the stock and the chowder come from Jasper White’s cookbook, 50 Chowders, which I’ve raved about many times. 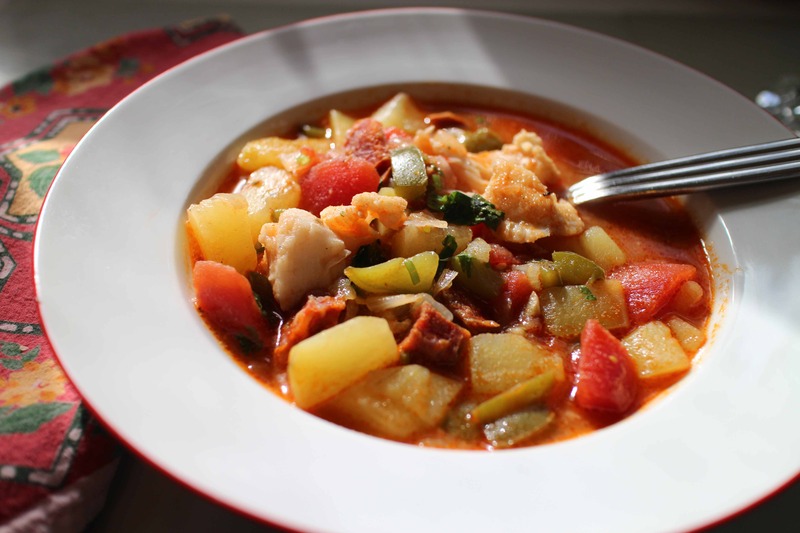 He calls the dish “South Coast Portuguese Chowder” in honor of the large Portuguese population of the south coast of Massachusetts and east coast of Rhode Island. The key ingredient is the chorizo, removed from its casing and chopped. It’s a lesson in how adding even a little of something so piquant can transform an entire dish. White suggests using canned tomatoes because of their robust flavor. He adds them after the potatoes have cooked and released their starch. I’m a fan of the combination of potatoes and tomatoes but the acidity in the tomatoes inhibits the release of potato starch if they’re cooked together. I used Yukon gold potatoes since I wanted them to maintain their integrity and not become mushy. I followed White’s recipe pretty accurately but cut the vegetables into smaller pieces of different shape (dice versus slice). Served with crunchy bread and a little salad, this fish chowder stacks up well alongside classics such as bouillabaise and cioppino. 3 oz spicy dried chorizo sausage, casing removed and cut into ¼-inch pieces. Heat a large pot over medium heat and add the olive oil and bay leaf. As soon as the bay leaf starts to brown, add the garlic and stir. Just before the garlic browns, add the onion, green pepper and allspice and, cook, stirring until the onions are softened but not browned. Add the stock and potatoes and bring the mixture to a boil over high heat. (Add more stock or water if necessary to cover the potatoes completely.) Cover the pot and turn the heat down a little, allowing the potatoes to cook vigorously until just tender, 8-10 minutes. Reduce the heat to medium and add the tomatoes and sausage. Simmer for 5 minutes. Adjust the seasonings. Be liberal with the salt and pepper. Add the fish and simmer for 5 minutes. Remove the pot from the heat, and sit in the cilantro. Cover the pot and let the chowder sit for 10 minutes. The fish will continue to cook.